This hearty evergreen grows up to 100 feet in its native conditions of the moisture rich mountains of Japan. Sometimes called the Japanese cedar, these trees are happiest when given simulations of their natural environment and prefer and abundance of moisture, they love wet “feet” in well draining soil, high humidity and cooler temperatures. 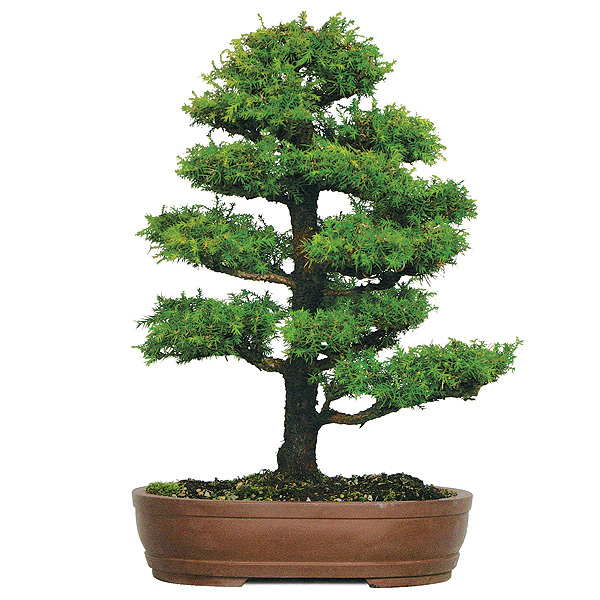 A perfect bonsai for those who tend to overwater their plants, this cedar-like tree will thrive in conditions that other plants would rot from. The 'Tansu' dwarf form of Cryptomeria japonica has lovely light green tiny, wedge shaped spikes and reddish brown peeling bark. During cold winters, the needled foliage will turn bronze, returning to its lovely shade of green in the spring. A moisture loving plant that thrives in cooler temperatures, it is still important to provide winter protection from drying winds and prolonged freezes. If brought indoors during the winter months, it will be important to ensure proper humidity as the dry conditions of an indoor environment could quickly spell death to this bonsai. In the hottest, driest months of summer, again, adequate moisture and protection are essential. This bonsai will enjoy full sun to light shade. The needles of your Japanese cedar bonsai can dehydrate easily turning brown in strong winds and hot summer sun, so ensure that you protect it as needed. This bonsai prefers humid environments. Water daily or as needed, never allowing the soil to completely dry out. You will need to water it less in the winter, just enough to keep the soil from drying out completely. You can enhance humidity by placing it in a sunny window of a bathroom on a humidity tray filled with stones. The added humidity obtained from daily household baths and showers will be beneficial to your bonsai. Feed your bonsai with a balanced diluted feed, once every two weeks, throughout the growing season; switching to a nitrogen free mix in the fall. will back bud from almost any point on the tree. Remove growth near base of all branches and on the underside of branches and near the trunk to encourage good air movement as well as letting the character of the trunk and bark show through. You can avoid die back from over growth of foliage by clearing old foliage out as new shoots grow. Spring pruning will encourage new growth around the wound. Spring is the best time to wire, but proceed carefully. Though the branches are flexible, they can and will snap without warning if bent too far. Once wired, bend only slightly, increasing the bend by a little every couple of weeks until the desired position is reached. This bonsai works well styled as a formal or informal upright, a twin trunk, a raft, and in group plantings, or rock and tray plantings. This bonsai can be susceptible to scale and red spider mites. Red spider mites can be controlled with a mixture of 1 tsp. dish soap and 1 quart warm water sprayed on foliage until desired runoff is achieved. Rinse well with tepid water. For scale, dab each shell with rubbing alcohol and remove each scale with a sharp knife taking care not to damage the bark. You will want to go over the entire tree to ensure that no scales are left as the eggs are protected under the shell and will cause infestation if not irradiated. Mildew can occur on this tree if foliage is overly congested so be sure to provide plenty of circulation ability with proper pruning. You can best propagate this bonsai with seeds simply planted outside in the spring. You can also take cuttings in the summer and early autumn. Procure a 3 inch cutting and dip in rooting hormone. Place in moist soil and provide a shady environment to encourage healthy root development. Your Cryptomeria bonsai will want to be repotted in mid to late spring, every two to five years, depending on age and growth; as the plant ages, it will need to be repotted with less frequency. Do not over prune the roots, and ensure that you are potting this bonsai in slightly acidic soil with high organic content and ensure that the soil has good drainage, which will prevent boggy conditions. This bonsai needs humidity and moisture, without proper levels of both, it will not survive.